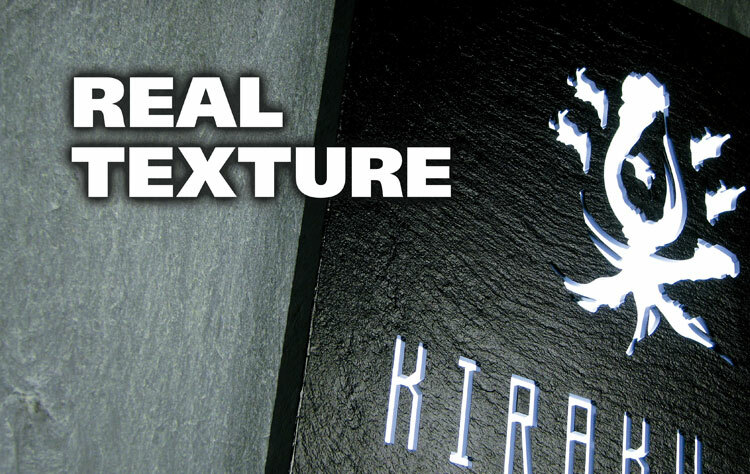 Truly recreating variety of textures by applying embossed finish, we offer a whole new lineup of 12 product types such as natural appearing texture of rock surface and driftwood, traditional Japanese paper pattern, leather texture, modern geometric design and classic brushed metal texture. We manufacture these products at size H390×W490mm with 3mm・5mm thickness. A fine combination of various cutting techniques and abundance of finishes allows creating a novel vivid visual representation. We also accept small quantity orders to manufacture products matching designers' original ideas and fitting specific motifs of a store. (Please contact us for details.) Create your signage and interior with splendid design and authentic atmosphere using the NEW Taff Lite Sign and D-Letter with REAL TEXTURE. * The size for samples RT-HL-01 and RT-PA-05 is H350*W450mm. 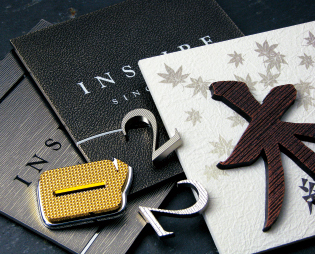 * Only a few sample finishes presented here. Many more variations of plating and paint finishes available. * The actual colors may slightly differ from images pictured above. * Orders for materials only are not accepted.